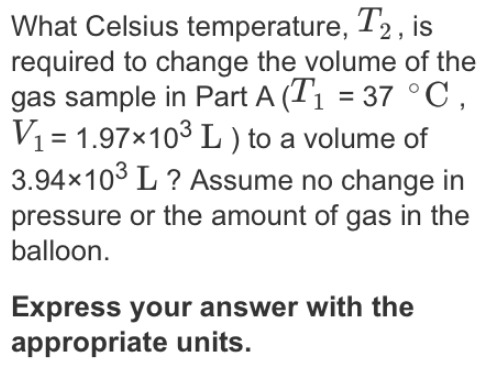 Solution: What Celsius temperature, T2, is required to change the volume of the gas sample in Part A (T1 = 37°C, V1 = 1.97 x 103 L) to a volume of 3.94 x 103 L? Assume no change in pressure or the amount of gas in the balloon. Express your answer with the appropriate units. What Celsius temperature, T2, is required to change the volume of the gas sample in Part A (T1 = 37°C, V1 = 1.97 x 103 L) to a volume of 3.94 x 103 L? Assume no change in pressure or the amount of gas in the balloon.